You know the blog, now watch the Channel 9 video featuring Damien Watkins, Rick Molloy, and Don McCrady. I like this one because they talk about how they ended up changing their minds over the course of development, moving from a language-based approach to a libraries-based one. They get into why that's better and what C++ 0x features they needed to make it possible. A nice way to spend a little under an hour. Yochay has been very busy talking to Channel 9 and preparing Windows 7 material for developers. Here's a blog post from early January that lists some taskbar related videos you will want to watch. Screenshots of the taskbar really don't convince you of how much easier it is to use. 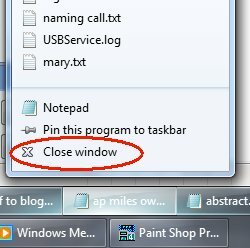 If I just move the mouse (no clicking) over the icon of one of the Notepad instances, they all show their thumbnails. One of them (the one I moused over) has a little red x showing in the thumbnail. Without clicking, if I move the mouse onto the thumbnail and pause a moment, I get the "peek" where that window appears (in case I can't tell from these tiny little thumbnails) and everything else goes transparent. If I click the little red x in the thumbnail, the instance closes. It's less clicks, it's noticeably faster and smoother. These are the sorts of things that are making me so glad I put Windows 7 on the prime laptop. I would not go back!